Advantages: Interesting and informative text; varied collection of period photographs; detailed plans in 1:72 and 1:48 scales; excellent colour profiles. Although over-shadowed by the more popular DH2 that followed it, the DH1 is nonetheless an important aircraft that deserves a place in British aviation history. 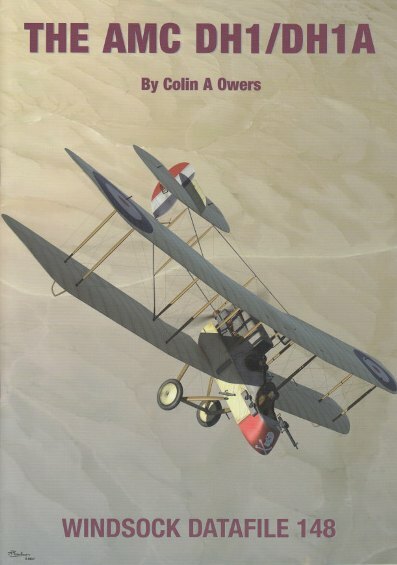 It was one of Geoffrey De Havilland’s earliest designs which set in motion a series of notable aircraft that would see sterling service throughout the Great War and beyond. The tale is told by Colin Owers and he does a good job of relaying the information to the reader. He discusses the history of the type as well as explaining the two-seater’s front-line service in the Middle East and its less glamorous role as a trainer. The indefatigable Marty Digmayer contributes with 6 pages of detailed drawings. These come in the form of 1:72 and 1:48 scale plans with both versions of the type being covered. Photographs of the DH1 and its variants are few and far between. So inevitably we come across some that are of indifferent quality but these are necessary to tell the whole story of this aircraft. There are 70 contemporary images and most are produced 2 or 3 to a page. This, and the large A4 format, is ideal for allowing maximum detail to be gleaned from each photo. This time around it is the job of Juanita Franzi to supply the artwork. She presents 3 competent colour profiles that comprise of 2 DH1s and a single DH1A. Rounding out the publication is a “Camouflage and Markings” section, as well as an appendix that tabulates the specifications of both types. The dimensions of the DH1/DH1A differ quite markedly depending on the source used. The author wisely tabulates all opinions and lets the reader make up their own mind on which are correct. This volume completes the Datafile coverage of operational wartime de Havillands. It provides both the modeller and enthusiast with excellent all-round coverage of an often forgotten aircraft.